"The Golden Compass" premiered Tuesday in London, and Hollywood hopes it is this holiday season's big blockbuster, but not if some conservative Christians can help it. Some are calling for a boycott of the film when it opens in the United States on Dec. 5 because Philip Pullman, author of the book the movie is based on, says he is an atheist. "Religion is at its best when it is furthest away from power," Pullman told CBS News Correspondent Richard Roth. "As soon as it gets its hands on power, it's no good." 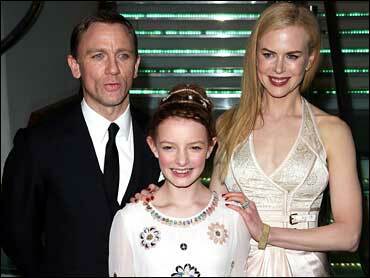 The film has a stellar cast - including Nicole Kidman and Daniel Craig - and a big-budget. But the book version has been called anti-Catholic. It tells the story of a young girl's battle against a mysterious organization steeped in spiritual overtones, which is seeking to rule the world. Some critics claim the book and the movie are really an attack on religion and the Catholic League is leading the fight. "It's stealth campaign, a dishonest way to produce anything," Bill Donohue, president of the Catholic League, told Early Show co-anchor Hannah Storm. "They want to make money. They want to make sure there's a second and third movie based on the books in the trilogy. This teaches atheism to kids. Phillip Pullman is very open about this. The movie is basically innocuous, but parents may want to say to their kids, 'You know what? A great Christmas present would be to buy his 'Dark Trilogy,' the name of the three books.' Now you've introduced your kids to atheism. I don't think most parents want to do that." Ellen Johnson, president of American Atheists, said the movie is about questioning authority, and that can never be a bad thing for children to learn. "There's nothing fundamentally wrong with that," she told Storm. "But even if you would succeed in getting people not to buy the books or see the movie, you can't censor the internet. Why are you focusing on a movie and these books when the whole world has books available on atheism that kids can get? It's good thing." The controversy now has the studio spinning "The Golden Compass" as a celebration of love and friendship. Kidman, who plays a glamorous villain with a soul of ice, rejects the claim that the movie's message is anti-church. "I don't see it as that, but it's always laid out for interpretation," she said. "But I would be surprised if people actually saw the film and felt that." But Donohue says the sinister group portrayed in this movie represents the Catholic Church. "It's the definition of the Catholic Church," he said. "They're teaching about the Pope convening with the bishops. The spin is too late now. They're trying to say all this could represent any authority. We're not talking about the police bureau or an abusive schoolteacher. They're talking about the Catholic Church. The book is clear. We boxed them in. We've put out a book on it. We've unmasked it, and that's why he's angry." But the movie's stars don't buy it. "You know what, if they do, tough," actor Sam Elliot said. "They're going to lose out. We're not going to lose out. They're going to lose out." "I think the Catholic Church will survive," Craig said. "It's survived much worse things than this."